Mobile devices host a slew of benefits for marketers, but pitfalls do exist. As the mobile landscape changes, so, too, do marketing needs. Approximately 57 percent of mobile users will refuse to endorse a company if they utilize a poor mobile site. When the risks are avoided, great plans thrive. Mobile applications aren’t necessarily contained to the future. They’re here now, and both tracking and marketing efforts are impacting the industry in new, innovative ways. Marketing, in any shape or form, requires intensive data collection. The modern business world relies upon strict data collection techniques—and any mobile app marketing plan void of such techniques is in trouble. Sure, at one time strategies were effective on a whim. Unfortunately, this isn’t the case today. Mobile ads need to be tracked, as do conversion rates. Why? Because mobile advertising expenditures lag behind mobile device media consumption. Right now, the door is open for innovative marketers taking advantage of consumer behavior. In 2015, mobile advertisement expenditures accounted for nearly 49 percent of digital advertising expenditures. Don’t miss the opportunity as such expenses increase. Traffic sources drive mobile app marketing. Sure, your app—and its provisioning app store—should be a primary traffic channel. You shouldn’t, however, neglect other sources. Too many marketers neglect other traffic sources, losing the advantages garnered through key networks. Be creative, and optimize your landing page, your website and your social media networks. As you dive into SMS and email campaigns, other traffic sources will spike your growth. They’re entirely different. Mobile interfaces are jam-packed with information. They require quick response, active administration and multiple feedback channels. As your mobile strategy evolves, your design team should format your mobile app’s design to accommodate for future growth. Mobile experiences are very different from desktop experiences, and your app design should make the ends meet. Prioritize data input, and grab the users attention in one direction. You’ll be surprised how far a smartphone interface can carry a marketing campaign. Moreover, you’ll be surprised by the traffic gained via simple, intuitive design. Mobile app marketing requires outside-the-box promotion, so don’t rely on direct ad networks to get the point across. Ad networks are the bastion of traditional marketing approaches, and mobile app promotion requires a little more than specialized expertise. Your mobile app requires a special attention to consumer nuances. App marketing revolves around relevant features and preferred services. While mobile ad networks do increase downloads, they should never be relied upon. In fact, you can sidestep traditional promotion agencies when creating an ad network. Just ensure your network provider carries a firm incentive to breed results. Ranks, while important, apply more to web pages. While your mobile app should utilize a rank-positive approach to web marketing, it shouldn’t overemphasize rank when leaving the gate. A higher mobile app ranking won’t necessarily translate to consistent, incremental downloads. If you’re placing funds in rank-targeting campaigns, you might be wasting dollars. Your app, instead, should achieve an optimal rank result relevant to its cost efficiency. Don’t target the number one spot if it doesn’t offer organic downloads. The number one spot is superficial if you’re just “tagging the wall.” Your app needs consistent placement, not a one-time win. Garner an understanding of incremental user gain, and target different rank levels through performance trackers. Don’t overspend, and constantly upgrade your platform to support new users. The rank will follow. Every strategy has its ups and downs. This applies to mobile app strategy as well. It is important for the marketer to research and understand what is at hand. In doing so, pitfalls and their consequences are abated. I agree that the above explained 5 pitfalls can affect mobile app marketer, however, the marketer must understand that what works for desktop technology will not always work with mobile. A shift in strategy is required to gain traction! Thank you for your comment. You make a great point. Mobile app marketers must avoid these 5 pitfalls. 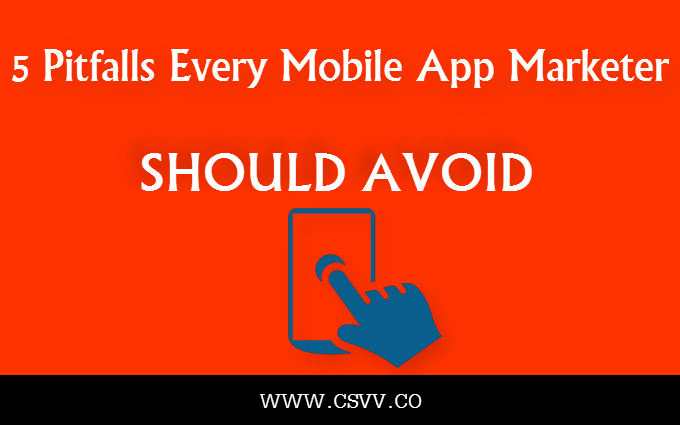 The guideline on how to be aware about these pitfalls is valuable and relevant to every mobile app marketer and also to those who are planning on becoming an app developer. Focusing Too Much on Rank – my take about this is app marketers must focus more on relevancy, quality, placements/navigations and value. Adding them all will help you get a higher rank. It all boils down in giving the right value. All in all, a wonderful article to read. Understanding the importance of mobile marketing, knowing the right tactics and avoiding the pitfalls is what this article is promoting. Thank you, Sorphorn! Great post! Thanks metz. I am glad you enjoyed the article. Yeah, you’ve highlighted the main points and i have enjoyed this article from the bottom of my heart. Thanks Metz..